Devon Meadows Primary School has become known within the region as a school, which strongly promotes Performing Arts. A tour of our Performing Arts room reveals a large collection of electric guitars, drums, electric keyboards and amplifiers! The school has a wide variety of tuned and untuned percussion instruments, a class set of ukuleles and a class set of acoustic guitars. All classes Yrs. P - 6 have a 1 hour lesson each week. This year the children in the middle school have been creating and exploring the “Art of Puppetry”. Using their iPads, the children record their puppet performances. 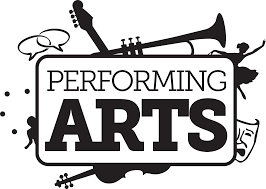 Performing Arts classes can involve singing, playing instruments, acting and/or dancing. The senior school students have also used iPads to record their project work. Working in groups they chose from a list of project choices. The students use what we call our “Prac/Jam” books, in which we have a collection of songs which we sing at the microphones and play instruments. Our jamming is a lot of fun! This is competition between many schools in the state. Each school has 7 minutes to present a story with dancing and acting. No dialogue is allowed!! This performance is open for students in Yrs 3 to 6. This is a happy family occasion when students perform Christmas carols and songs on the oval. We usually combine this event with a sausage sizzle and is a great way to celebrate the end of another busy year at Devon Meadows. Any student in grades 1 to 6 may choose to take part in the “Elective Guitar Program”. Lessons are at a small cost of $8 per term to the student. This minimal fee helps to maintain guitars with strings, picks, etc..
Two groups are conducted, a beginner group on Wednesday lunchtimes and an advanced group on Tuesday lunchtime (1.30 – 2.30 pm). Since 2002, we have had a School Rock Band at Devon Meadows Primary School. At the time of writing, this year’s band doesn’t have a name yet. This year’s band consists of four singers, two guitarists, two bass guitarists and a drummer. They have made a tremendous start to the year and we look forward to having them perform to the school throughout the year.